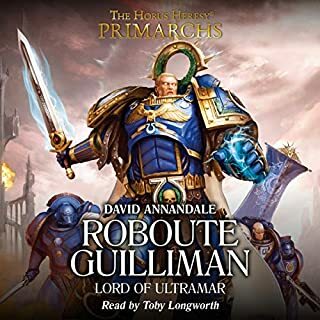 Long before the coming of the Imperium, the realm of Ultramar was ruled by Roboute Guilliman, the last Battle King of Macragge. Even after learning of his true heritage as a primarch son of the Emperor of Mankind, he strove to expand his domain as efficiently and benevolently as possible, with the XIII Legion Ultramarines as his alone to command. Cool, nicely read but short. Among the Space Wolves there are as many sagas as there are warriors. 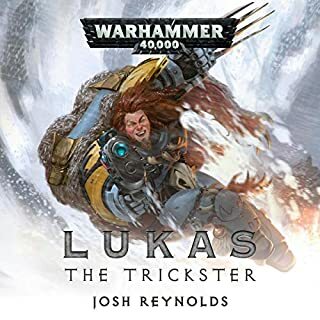 Though none quite like that of Lukas the Trickster. Renowned and reviled in equal measure, the Jackalwolf has ever stood apart from his brothers, passed from pack to pack by embittered Wolf Lords. 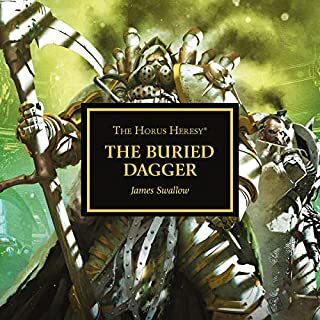 But as a new enemy invades the icy reaches of Fenris at the height of the Helwinter, Lukas finds himself facing a foe who may rival even his legendary cunning - the drukhari corsair, Duke Sliscus. Great bit of story telling! The Great Crusade that has taken humanity into the stars continues. The Emperor of Mankind has handed the reins of command to his favoured son, the Warmaster Horus. 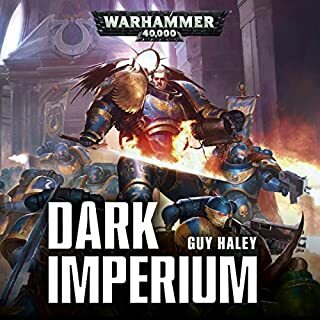 Yet all is not well in the armies of the Imperium. 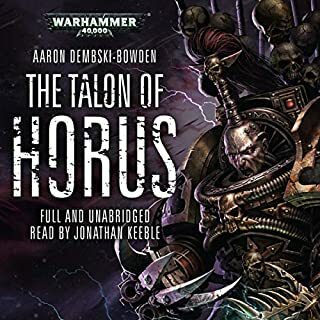 Horus is still battling against the jealousy and resentment of his brother primarchs, and when he is injured in combat on the planet Davin, he must also battle his inner daemon. With all the temptations that Chaos has to offer, can the weakened Horus resist? Toby Longworth brings this story to life! 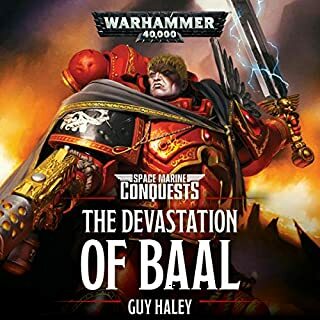 This a really enjoyable series, even for for those like me who have only a passing acquaintance with the Warhammer 40,000 universe. a great listen, a tragic story of manipulation and betrayal. 2 down, 48 to go! 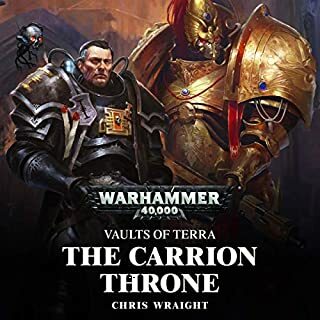 40K is a franchise so beloved by its authors and praised for its depth, breadth, and richness of texture. It's very disappointing then that its lynchpin and dramatic high-water-mark seems rushed, forced, and ultimately unrealistic, especially when this trilogy prides itself on melding modern and classical styles: an interest in ethics within a plot framework evoking epic poetry. 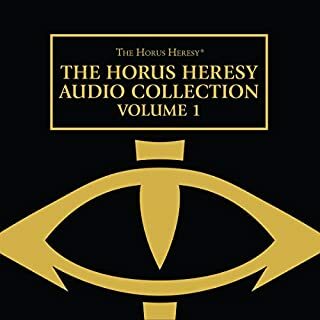 I am of course referring to the turning of Horus. 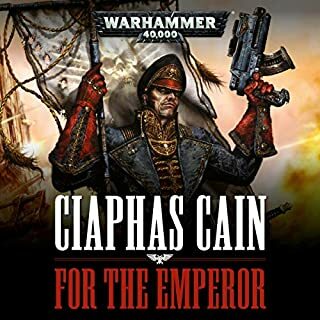 Such care was taken in the first book to build his character into that of a benign despot; conscientious enough to control his psychopathic instincts yet fallibly Human enough, like all of us, to question the impositions of the super-ego, symbolised in the Emperor, 'father' of Horus. It's a stark and painful thing, then, when Horus is suddenly inverted into a villain, albeit within the established paradigm of his character. People do bad things because there is something inside them that is flawed, and though this is signified throughout, we still fall short in believing Horus's reasons for forsaking everything he stood for. It's too much, too soon. It just gets better and better. Horus with strength and guile works with cunning that he even beguiles the honoured Mornival. They work and fight and conquer not realising the real goals they're fighting for. 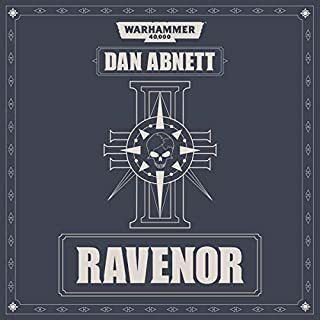 The unique and highly respected Mornival following the Warmaster Horus and all the while in the background from unexpected ............well you'll have to read this, the storyline is First class and the narration exceptional. Now for book III 'Galaxy In Flames '. good naration, good story, looking forward to the next book, Nice to see a lot of the Characters from the first book make it into the next. The story is great, no disputing that. 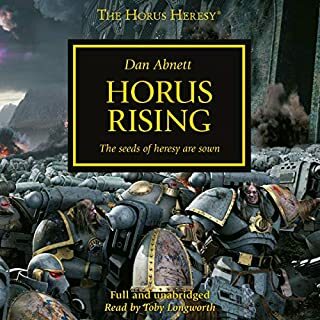 For me it isn't as good as horus rising but it's still a great novel. Unfortunately the narration on this is bad enough to make me wince at times. Some characters are fine such as Garviel, Horus and Karkasy but others are done so badly that I have to laugh. 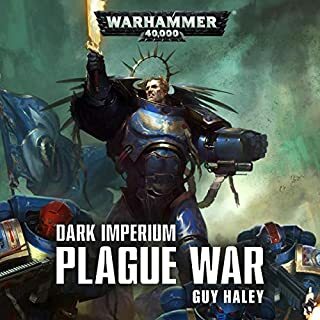 For example Abaddon, the hulking, grumpy giant, baddest astartes around, born and raised in the roughest slums of Cthonia... sounds like a posh, nasally nerd. It's really, really bad and enough to snap me out of the story at times. The narration itself is fine, some characters are fine, others... Not so much. I loved book 1. having Horus as a hero was really fascinating and I was looking forward to how he started to fall. this book tells that part and I was disappointed. Love it, like always listens though it twice. Would highly recommend to anyone into scifi. Toby Longworth does an excellent job of taking you into the action as the Warmaster Horus begins his ascent. This book moves a little slow in the beginning but man does it pick up. I am reading this series for a second time AMAZING even still knowing what happens. The detail these authors put into their work is just top notch. I read "Horus Rising" and loved every bit of it. Unfortunately, life has been busy and I haven't had much time to read. 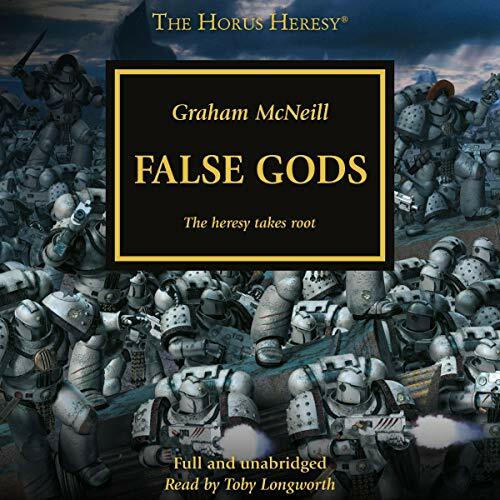 I purchased "False Gods" on Audible, so I could continue with the series. Toby Longworth has given an amazing performance. His narration is one of the best I have ever listened to. 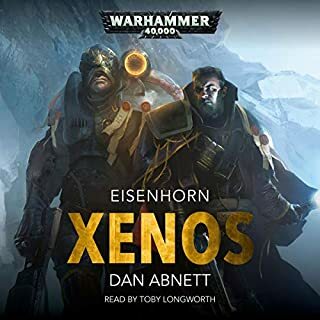 I was glad to see that Longworth is the narrator throughout the series. 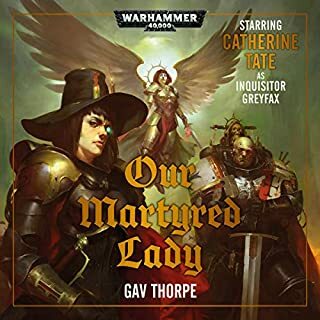 I am looking forward to listening to the rest of the series. 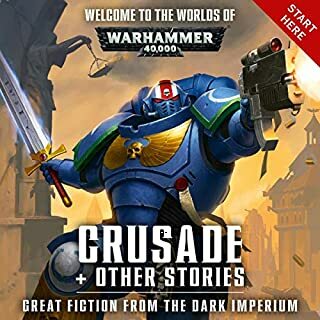 any 40k fan should really get into these novels, they're excellent and well written, not to mention incredibly in depth. 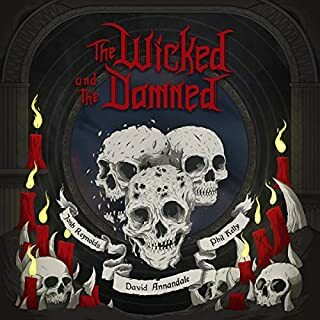 good story, I would like to know a lot more and I wish it was longer as there are a lot of questions left open for more or less the reader to choose. 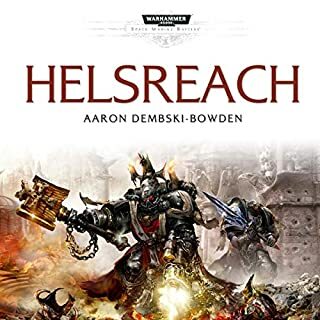 Great book for a great storyline in the Warhammer universe. All the books in this story are great and the narrator makes it that much more interesting. Listening how the Luna Wolves sealed the fate of Billions to eternal damnation was so riveting. They did not do it out of Greed or Malice but of desperation to save their Warmaster and father. The table is set and pieces are starting to move. one of the most intense and satisfying books I've ever read. 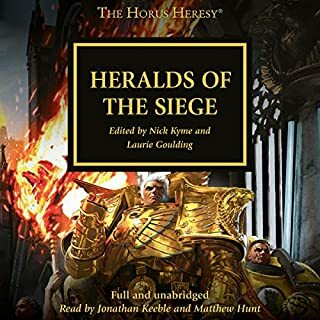 the narration is spectacular, and almost every facet of the writing is engaging and delivers on its reputation as part of the Horus Heresy series.